On October 17-19, the VI Jornadas del Personal del Sistema Nacional Integrado de Salud de Uruguay (VI Staff Days of the National Integrated Health System of Uruguay) were held, organized by the Ministry of Public Health (MPH), through its Division of Evaluation and Monitoring of Health Staff, with the support of the PAHO/WHO Representation in Uruguay. With the objective of presenting the results achieved with the project “Knowledge Management in Human Resources in Health” (KM HRH), BIREME participated in the opening of the event, represented by Renato Murasaki, Information Methodology and Technology Manager. The results presented to the participants of the meeting were the repository of scientific and technical production identified by the Network of Observatories in Human Resources in Health of Latin America and the Caribbean, the search interface with scientific and technical literature on Human Resources in Health published in information sources from the Virtual Health Library (VHL), the tables of infometric indicators of scientific and technical literature on Human Resources in Health available on databases LILACS and Medline, and the web site, integrated to the Regional Observatory of Human Resources in Health, which promotes access to all the products mentioned above. The KM HRH project began on March 2017, in coordination with the Unit of Human Capacities in Health of the PAHO/WHO Brazil Representation. It originated from the need to identify content learned and knowledge gaps, as a reflective act after the end of the Decade of Human Resources in Health (2006-2015), through the mapping of technical and scientific production in the field, with emphasis on the following thematic axes: employment, education, human resource planning, regulation, management and administration, outlay, syndicalism, public policies, health teams and information systems. BIREME also promoted a Workshop on methodologies for systematic revision, knowledge translation and decisions informed by evidence. The Workshop took place on October 16 and was ministered by Veronica Abdala, Cooperative Information Service Manager. 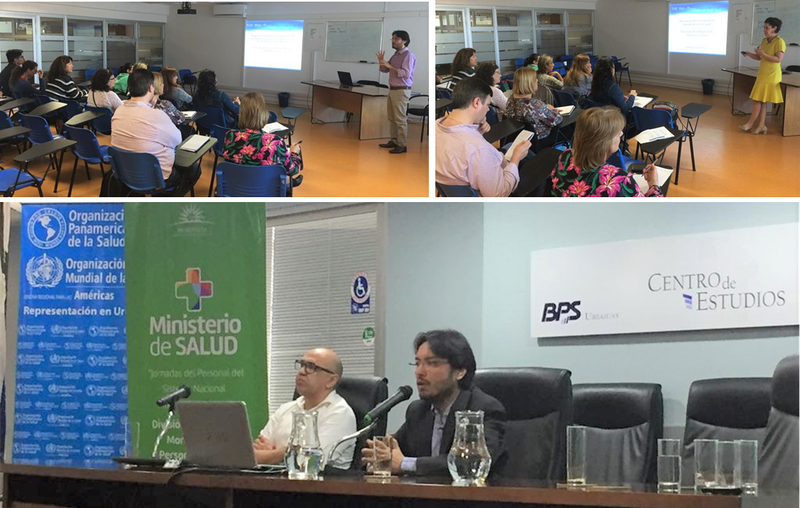 Approximately 20 staff members of the MPH attended the presentation on the application of appropriate methodologies for generating new systematic revisions and syntheses of evidence from qualitative studies related to the field of Human Resources in Health, in the context of Latin America and the Caribbean. A few of the topics discussed with the MPH team were: the participation of the Division of Evaluation and Monitoring of Health Staff in the governance of the National VHL Uruguay, strengthening the development of the Repository of Educational Resources of the Uruguay node in the Virtual Campus in Public Health and collaboration in the organization and diffusion of HRH documents produced by the MPH in the repository for technical and scientific production on HRH integrated to the HRH Regional Observatory. In coordination with Dr. Monica Padilla, Coordinator of the Technical Unit of Human Capacities for Health of PAHO/WHO Brazil, a new work plan is being developed with BIREME in order to strengthen the products delivered in 2018 and generate new products in 2019.